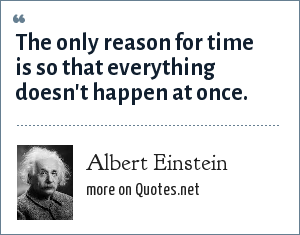 Albert Einstein: The only reason for time is so that everything doesn't happen at once. 시간의 유일한 이유는 모든 일이 즉시 일어나지 않기 위해서입니다. "Albert Einstein Quotes." Quotes.net. STANDS4 LLC, 2019. Web. 25 Apr. 2019. <https://www.quotes.net/quote/9385>.